A stage with varying depth positions provides the raised performance space. The stage width may be extended either side using rostrum elements. A full set of backing ‘black/white drapes’ are permanently available. Other drapes are installed to create divisions within the space. Installed around the walls is a hanging system for displays and banners. Hanging of other decor items is possible on consultation with the technical crew. Power points are distributed around the building including 16A single phase (schuko), 16A 3-phase and 32A-3 phase outlets. General lighting suitable for meetings or dinner moods utilizes the architectural lighting units and a few theatrical spots. A selection of pre-programmed lighting states are accessible using a push-button box. 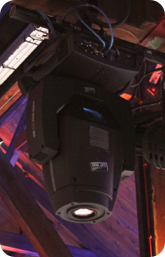 Productions or events requiring more complex illumination, lighting design and operation can utilize the entire theatrical stage lighting rig installed in the Wharf, complete with moving-heads, follow spot and lighting desk control. The sound installation is capable of delivering 98db for events. The 24 channel audio desk drives a stereo FOH mix by SevenSound, dance floor cover and two sets of delays plus a hanging sub-bass. A compliment of 5 Sure Pro ULXP4 wireless mic sets are in-house plus CD playback and compressor. The Wharf has a permanent large Video Projector installed. This is mounted on a Moving Yoke and may project on the main front screen or the smaller side screen. Exterior architectural lighting is permanently installed on the rear facade of the building. For night time use the pontoon dock may be lit with additional atmospheric flood lighting. 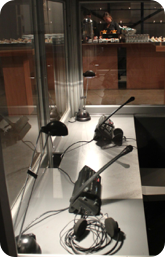 Other extra equipment such as Translation Booths & services, Screens, Video equipment, Lighting and Sound etc. can easily be provided as necessary on an additional rental basis.